Do you have people in your business who you have identified as having the potential to step into a management position? Or perhaps you have a new manager who would benefit from developing their skills, knowledge and confidence to enable them to lead their new team more effectively? 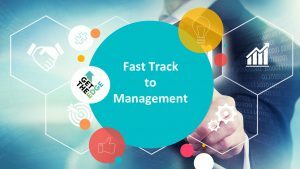 We are sure you agree that developing home grown talent is key to business success, if so then our Fast Track to Management Programme could be just what your looking for. This comprehensive four day workshop, is designed to accelerate a delegates ability to be able to lead their teams more effectively. Through a series of interactive learning activities, professional coaching sessions, and practical assessments they will have the confidence and the ability to influence their teams and deliver an improved performance. One day per quarter allows the delegates to let the material sink in. Each Module is designed to help the potential new manager understand themselves and others and also to consider the key areas below that apply to their new role.